Mac Joinery’s speciality lies within our kitchen renovations and laundry, which we have a long experience in. Especially in the manufacturing of kitchen cabinets, that are customised for customers with different ideas and preferences. Whatever size kitchen renovations you need, we make renovating kitchens a seamless process. 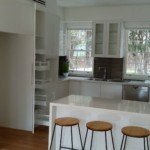 Whatever kitchen remodelling plans you desire, Mac Joinery will cement its repute as one of Sydney’s best kitchen remodelling companies, by creating your perfect kitchen at a time and budget that suits you. Our products and fittings are of the highest quality. We have a wide variety of materials and brands available for you to choose from. Kitchen Renovations Hornsby are simple since you don’t have to worry about a thing. We will ensure that the project runs smoothly, that you have nothing but top-quality products in place and that the project is completed right on time. Contact Mac Joinery for more information!